Over the last half century of presidential primaries, there has been an almost inviolable rule of thumb: The candidate that wraps up his party’s nomination first goes on to win the general election. There is a certain logic to that. Candidates that can eliminate their primary rivals most quickly have more time to unify their party and prepare for the fall campaign. And in the process, they usually show themselves to be potent vote-getters with broad appeal, particularly to the various elements within their own party. That is basically how it has worked from 1964 until now, with the conspicuous exception of 2008. Then, the negative effect of a lengthy primary campaign was thrown into question. Democrat Barack Obama took three months longer to nail down his party’s nomination than Republican John McCain. Yet Obama won the race handily in November. The long Democratic battle with Hillary Clinton is credited with providing Obama with a host of assets. It forced him to improve his performance as a candidate and to organize not just the early states but the entire country. And the high energy Obama-Clinton struggle enabled the Democrats to dominate the national debate at a time the 2008 campaign was taking shape. Now, with the Republicans facing the prospect of a long, delegate-counting campaign of their own, the question becomes: was 2008 an aberration in the long-term undesirability of lengthy nominating races? Or was it the new reality of American politics, where a long primary contest can actually be a virtue rather than a vice? Certainly, from the rise of presidential primaries in the 1960s through 2004, the negative consequences of drawn-out nominating races were, with rare exceptions, on display every four years. Much more often than not over the past generation, the presidential candidate that was able to wrap up his party’s nomination first in the winter or spring went on to win the general election that fall. The 2008 campaign, however, proved to be a major exception to that basic trend. Republican John McCain had the GOP nomination firmly locked up by the ides of March while Democrats Barack Obama and Hillary Clinton battled through the end of the primary season in June. Theirs was the longest-running nominating race since Democrats Walter Mondale and Gary Hart dueled to the conclusion of the 1984 primaries. Yet in 2008, Obama went on to win the general election handily. This chart starts with 1976, the first election that a majority of states held presidential primaries. Notes: An asterisk (*) indicates an incumbent president. A pound sign (#) notes that Democrat Al Gore won the nationwide popular vote in the 2000 presidential election, but Republican George W. Bush took the all-important electoral vote. The “at” symbol (@) indicates that the 1976 Republican race was not decided until the convention that summer. The month of the nominee’s last primary loss refers to contests where the nominee’s name was listed on the ballot. In 2000, an Uncommitted line received the most votes in that year’s non-binding Michigan Democratic primary but the names of neither Gore nor Bill Bradley were on the ballot. 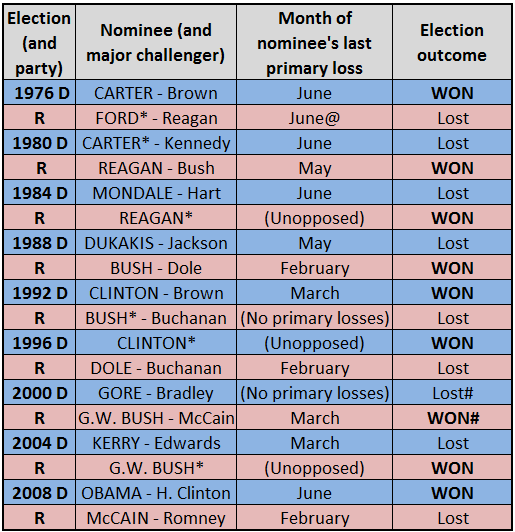 The month of the nominee’s last primary loss refers to contests where the nominee’s name was listed on the ballot. Source: Guide to U.S. Elections, Volume I (CQ Press). In 1964, President Lyndon Johnson ran essentially unopposed for the Democratic nomination, while conservative Sen. Barry Goldwater of Arizona could not nail down the nomination of a divided Republican Party until after the primary season ended in June. Johnson won election that fall in a landslide. In 1968, former Vice President Richard Nixon cruised to the GOP nomination with few bumps along the way, while Vice President Hubert Humphrey (who had not contested a single primary state) was the controversial choice of a chaotic Democratic convention late that summer. Nixon was elected in November. In 1972, President Nixon faced two little-known Republican congressmen en route to easy renomination. In contrast, Sen. George McGovern of South Dakota, a vocal anti-Vietnam War candidate, secured the Democratic nomination only after a long primary fight that vividly displayed the fissures within the party. Nixon was reelected in a landslide. The nominating campaigns on both sides in 1976 lasted the entire primary season. Former Georgia Gov. Jimmy Carter, though, had the Democratic nomination in hand at the end of the primaries in early June. Republican President Gerald Ford could not nail down the GOP nomination against former California Gov. Ronald Reagan until his party’s convention two months later. Carter was elected in the fall. In 1980, Republican Ronald Reagan dispatched his last primary rival (George H.W. Bush) in May. Meanwhile, President Carter was dogged throughout the primary season and on to the Democratic convention by the party’s liberal lion, Sen. Edward Kennedy of Massachusetts. Reagan won decisively in November. In 1984, President Reagan ran unopposed for renomination, while former Vice President Walter Mondale struggled through the Democratic primaries to nail down a delegate majority. Reagan went on to a landslide reelection victory. In 1988, Vice President George H.W. Bush swept the large, Southern-oriented Super Tuesday in early March, putting his campaign for the Republican nomination on cruise control. Democratic Gov. Michael Dukakis of Massachusetts did not get a similar grip on the Democratic nomination until weeks later. Bush was elected in November. The 1992 campaign was the only one in the 1964-2004 period that the “first in the clubhouse” trend did not point to the general election winner. President Bush had his embarrassing moments against conservative commentator Pat Buchanan, but was essentially in control of the GOP nominating process from the beginning. In contrast, Gov. Bill Clinton of Arkansas had to survive a shaky start before hitting his stride in the Democratic primaries. Yet it was Clinton, not Bush, who was elected president in 1992. The situation returned to normal in 1996. President Clinton ran essentially unopposed for the Democratic nomination. Senate Majority Leader Bob Dole of Kansas suffered some primary losses in the early going before nailing down the Republican nomination. Clinton won that fall. In 2000, there was a virtual tie all the way around. Both Democrat Al Gore and Republican George W. Bush quickly drove their last major challengers from the field at the same time — just days after the Super Tuesday balloting in early March. Gore had few problems at all dispatching Bill Bradley; Bush lost a number of early primaries to John McCain but overwhelmed him on Super Tuesday. In November, they campaigned to what was in essence a dead heat. Gore won the nationwide popular vote, but Bush won the critical vote in the Electoral College. Nothing so unusual happened in 2004. Sen. John Kerry of Massachusetts started fast, suffered only a handful of primary losses, and wrapped up the Democratic nomination quickly. But it was to no avail against President Bush, who became the third president since 1984 to use an unopposed renomination as a stepping stone to reelection. Altogether, that makes 11 presidential elections from 1964 through 2004, nine of them won by the candidate who locked up his party’s nomination most quickly. Add in a 10th election in 2000 that was basically a tie from start to finish, and it makes for a pretty solid trend. It is a trend that in 2012 would favor President Obama. Like Reagan, Clinton and George W. Bush, he is running for a second term with no opposition for renomination, one of the most critical assets an incumbent president can possess. Meanwhile, the Republican nominating process, already nearing the halfway point in terms of states that have voted, is not garnering rave reviews. The ongoing bickering has tended to drive up the negatives of the major candidates while sapping the enthusiasm of Republican voters. For many GOP leaders and grass-roots activists, the Republican contest could not end soon enough. Yet it is not the short term that counts at this point in the presidential election, but the long term. And that remains to play out over the next eight months. One of the major assets that enabled Obama to survive a lengthy nominating campaign in 2008 was the fact that the Democrats had a strong wind at their backs. This time it is not clear yet which party, if either, may benefit from such an assist. There are plenty of economic-related factors that might send the wind blowing the Republicans’ way more readily than the Democrats. And if that happens, the GOP nominee — as Obama in 2008 — will likely reach the White House in spite of a primary battle both long and contentious. Not since the 1976 contest between President Gerald Ford and former California Gov. Ronald Reagan has a Republican presidential nominating campaign been undecided going into the party’s national convention. Ford prevailed on the first ballot that year, with 1,187 delegates to 1,070 for Reagan. The vote was sharply divided geographically, with Ford winning more than three-fourths of the delegates from the Frost Belt states of the Northeast and Midwest, and Reagan garnering more than three-fourths of the delegates from the Sun Belt states of the South and West. With more delegates in 1976 from the Frost Belt than the Sun Belt, Ford was able to narrowly capture the GOP nomination. As with congressional seats, there has been a steady flow of Republican delegates over the last few decades from the Frost Belt states of the Northeast and Midwest to the Sun Belt states of the South and West. In 1976, when Gerald Ford outlasted Ronald Reagan for the GOP presidential nomination by a total of just 117 delegates, 53% of all delegates were from states of the Frost Belt. This year, 55% will come from states of the Sun Belt. 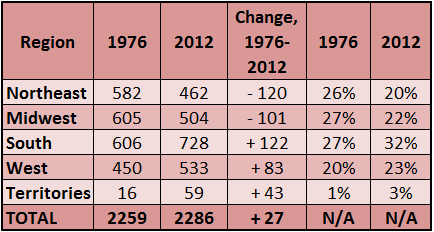 It is arguable that if the current delegate totals were in place in 1976, Reagan would have won the Republican nomination that year. Reagan, for instance, won all 100 delegates in Texas alone in 1976. This year, Texas will have 155 delegates. Note: Percentages do not always total 100 due to rounding. 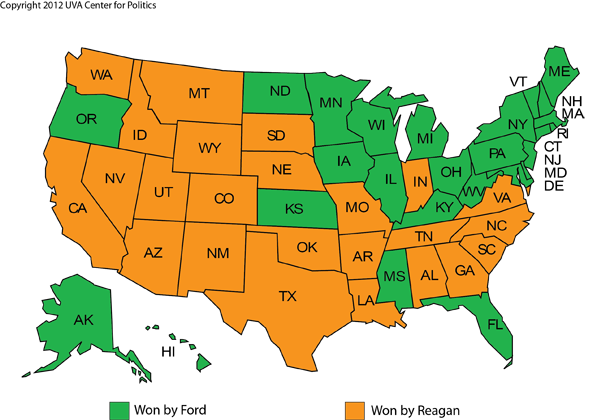 See Note in Chart 2 for states in each region. Sources: Guide to U.S. 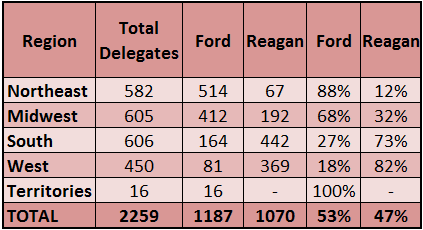 Elections, Volume I (CQ Press) for 1976 delegate totals; Republican National Committee for 2012 delegate totals.